Meet Your Neighbor Mary Alice Huntoon of Stronghurst. Just recently Mary Alice was told she was living in the oldest house in Stronghurst. That was from information that was being collected for the Stronghurst 125th Celebration. Mary Alice is a Stronghurst born citizen who attended first to twelfth grade at Stronghurst schools. This was before there was kindergarten and preschool. She said, "My mother took care of this before I entered first grade." Her parents are the late Fleda Mae and Eddie Charles Smith. Following high school graduation she went to Western Illinois University in Macomb, and at the same time, started testing individual cows milk in Warren/Henderson counties. After graduation from Western Illinois University she married Norman Huntoon in July. In the same fall that she and Norman were married she started teaching Home Economics at G & O High School at Gladstone. She taught at G & O until they merged with Biggsville and then became Union High School. At that time she and Normal lived at rural Monmouth. She was then offered a contract at Warren High School (now United) near Monmouth, where she taught for many years. While teaching at Warren she completed her Masters of Education at the University of Illinois at Champaign-Urbana. She continued testing cows milk and cow herds were added in Mercer and Knox counties. Milk testing changed from carrying a pail of individual cows milk to weigh and sample, the milking pipeline and milk meters. The individual cows records were always kept on the computer. After retiring from teaching she moved back to Stronghurst and completed the basic EMT course and continues to be an active member of the Stronghurst Ambulance service. Following her husband, Norman's passing, Mary Alice found herself raising cattle, farm crops and cats! 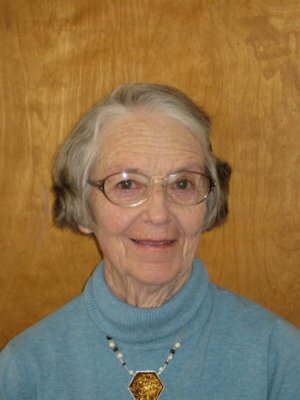 Mary Alice joined the local Retired Teachers Organization, HCE better known by the old name, Home Bureau, volunteers at the Henderson County Fair and helps individuals in the community with special needs. Her free time includes crafts of any type. She said, "I always have several projects going at one time." After breaking her arm three years ago gave up full time milk testing but continues as a certified field technician, to help cover the state, at milking competitions. "Life is what you make it, live every day to it's fullest". Mary Alice said, "I only wish I had one extra hour a day just for myself"! You've seen her name in different articles in the Quill, and now you know a little more about the person who writes those articles. I was privileged to have "Mrs. Huntoon', as so many of you also have, as my home economics teacher.